When you access the Basic Scheduling tool, the information for the Task tab options is predefined with the selected report procedure (FEX) information. You can complete the available task options, such as specifying parameter values, as well as select whether or not to burst the report. The following image shows an example of a predefined Task tab in the Basic Scheduling tool. Path. Shows the report path in the Repository or on the Reporting Server. Procedure. The name of the procedure you are scheduling. Server Name. The Reporting Server to which the report procedure (FEX) will be submitted. Execution ID. The user ID running the report procedure (FEX) on the Reporting Server. Click on the Password button to the right of this field to set the password. Alert. Specifies how to reactivate the alert or to deactivate the alert condition when it is triggered. Click Alert to specify the alert options, as shown in the following image. For more information, see the Business Intelligence Portal manual. Select one of the following options from the Alert Options dialog box. Automatically Reset. After the alert is triggered, reactivate the alert when the condition is no longer true. The system will keep checking the condition after the alert has been triggered. As soon as the condition is no longer true, it will reactivate the alert. This is the default value. Continue After Alert. After the alert is triggered, reactivate the alert immediately. Deactivate Schedule After Alert. Deactivate the schedule after the alert is triggered. Delay. Restart the alert after a specified period. You can specify to restart the alert after a maximum of 99 hour(s), day(s), week(s), month(s), or year(s). Caution: Be sure that you set the schedule interval to a time period greater than the time it takes to run the scheduled procedure. When the schedule interval is less than the time it takes to run the procedure and the Delay option is selected, an alert schedule will distribute (based on the Distribution that you selected) more frequently than expected. For email distribution, this can result in unnecessary distribution of emails which can impact the business or operational goals of the Alert report distribution. Burst Report. If you want to burst the report, select the Burst Report check box. The burst feature enables you to instruct the Reporting Server to create the report in sections so that they can be distributed separately. For more information about bursting, see Bursting a Report. Override the Format Specified in the Procedure. Select this check box to indicate a format other than the one specified in the procedure. Report Format. If you want to override the format that is specified in the procedure, select the Override the Format Specified in the Procedure check box. Select a format output from the Report Format drop-down list. HTML is the default value. 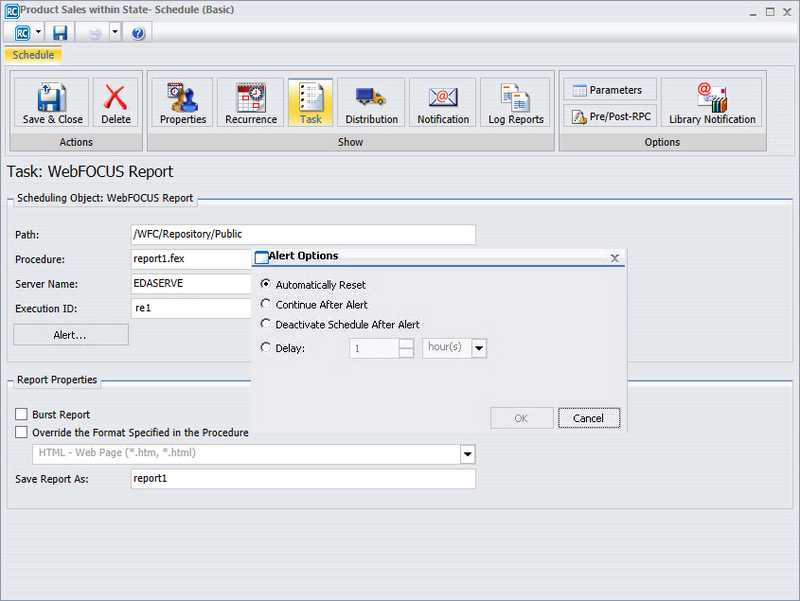 Report formats can be limited depending on the ReportCaster	configuration. For more information, see ReportCaster Configuration. Note: When scheduling a Graph procedure (.fex) containing a PCHOLD statement that uses JPEG, GIF, PNG, or SVG, if you do not select a format in the schedule, the output will be distributed in PNG format, unless you add the extension JPEG, GIF or SVG to the Save As value or file name in a Distribution List. Optionally, if you require that the output be distributed as a JPEG, GIF, or SVG file, specify that format in the schedule. To do so, you can select the Override the Format Specified in the Procedure check box, as described above. Save Report As. Type a file name to assign to the report when it is distributed. This field defaults to the name of the report procedure (FEX) and has an .htm extension. Blank spaces and special characters are replaced with an underscore character. For example, the schedule for the Product Packaging & Price report assigns the default Save Report As value as Product_Packaging_Price.htm. Note: When the Save Report As field contains an amper variable followed by a file extension, the separating characters between the amper variable and the file extension must be either three period (.) characters, or the vertical bar (|) character, as shown in the following examples. The file extension is preceded by two additional period characters. For example, car_&YYMD...csv. The file extension is preceded by a vertical bar character. For example, car_&YYMD|.csv. 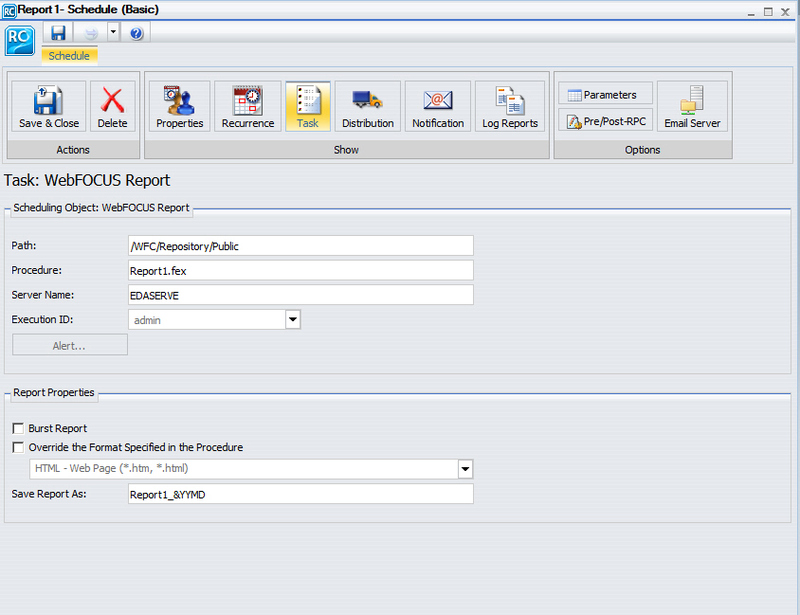 You can customize a report and control its execution with parameters. When scheduling a report procedure (FEX), the schedule task Parameters section allows you to supply a value for parameters referenced in the report procedure or add a parameter to the schedule by creating a new parameter and specifying the parameter name and value. For information on parameters, also referred to as variables, and how they are utilized in report procedures, see the Customizing a Procedure with Variables topic in the Developing Reporting Applications manual. If your Server Procedure contains Pre/Post Procedures, see How to Use the Pre/Post-Procedures Tab or a Report. If the scheduled procedure contains parameters for which values must be supplied at run time, these parameters are displayed in the parameters section of the scheduling tool. In the Basic Scheduling tool, click the Parameters tab to open the Task Parameters dialog box, shown in the following image. Parameters may have default values and may have values that can be selected from a static or dynamic list. For more information about selecting parameters in the Scheduling Task Parameters dialog box, see the examples provided in this chapter. For more information about defining parameters, see the Developing Reporting Applications manual. The maximum number of characters for each individual parameter value is 3200. You can store multiple values for a single parameter. Multiple values for a parameter are stored as one entry, which must not exceed the 3200 maximum character limit. ReportCaster	displays the description for the parameter when it is specified in the procedure. Otherwise, ReportCaster	displays the parameter name. ReportCaster displays default variable values, as well as static or dynamic single-select and multiselect lists. The No Selection option is displayed for dynamic multiselect lists. When selected, this option does not perform any data selection test on that field. ReportCaster	does not support using the -HTMLFORM command to create a dynamic selectable list of parameter values. As an alternate method of creating a dynamic selectable list of parameter values, you can create an HTML form with a schedule option with the Developer Studio HTML Composer tool. For details on adding the Schedule button to a form, see the Designing a User Interface for a Web Application With HTML Composer manual. then ReportCaster displays COUNTRY1 in the Parameters window. ReportCaster	will not prompt for variables with defaults set by the -DEFAULTH command. The purpose of the -DEFAULTH command is to assign a default value to amper variables and not be dynamically prompted for that variable. ReportCaster	does not prompt for the value of its internal variables that are set by the Distribution Server at schedule execution time. For example, &DSTOWNER is the user ID of the schedule owner. If this parameter is referenced in a scheduled procedure, the value will be available because the Distribution Server sets the value to the owner of the schedule at schedule execution time. However, the scheduling tool will not prompt for this value in the Task Parameters dialog box. If you are specifying the entire WHERE condition as the parameter value, you must enclose the value within two single quotation marks rather than a double quotation mark. For example, ''WHERE CAR NOT LIKE MOTO%''. If you are only specifying a value as the parameter value, you do not need to enclose the parameter value within quotation marks. For example, O&DINFO. If you want to specify parameter values in a pre-processing or post-processing procedure, these must be typed in by selecting the Pre/Post-RPC tab. See Schedule Pre-Processing and Post-Processing Procedures for information about schedule pre-processing and post-processing procedures. Once a parameter is stored for a schedule, ReportCaster	will continue to display that parameter in the Parameter list and submit the parameter to the Reporting Server when the schedule is run even if the parameter is removed from the underlying report. To remove the parameter from the schedule information, edit the schedule and delete the parameter. For information on how to delete a parameter from a schedule, see Deleting a Parameter. A parameter value that contains special characters should not be used in a schedule setting that refers to an output file name, since file names cannot contain special characters. Examples of affected schedule settings include the Save Report As value, the Report Name value for single-file FTP distribution, and the Zip File Name. Specifying default parameter values can be done with the -DEFAULT or -DEFAULTH command or within the WHERE statement. Default values specified with the -DEFAULTH command are not prompted for. For more information on parameter prompting, see the Amper Auto-prompting topic in the WebFOCUS Developing Reporting Applications manual. 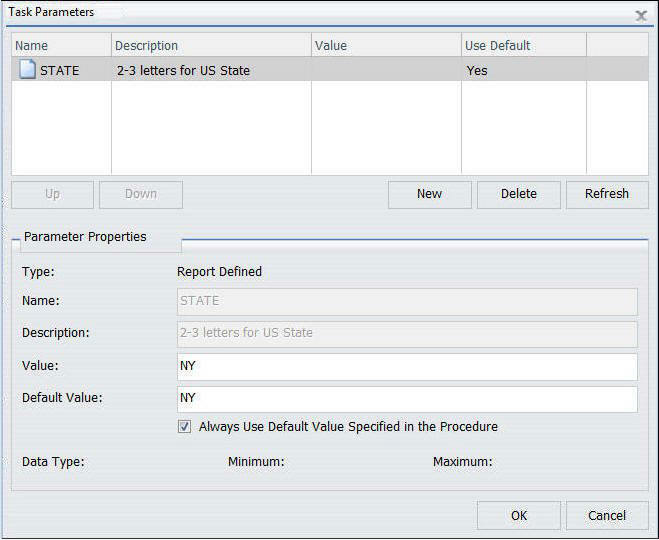 The following procedure sets a default value of NY for the STATE (2-3 letters for US State) parameter. For more information on creating and specifying values for parameters, see the WebFOCUS Developing Reporting Applications manual. The parameters that have default values defined in the report procedure (FEX) are listed within the Parameters tab with the default value in the Value column. When parameters are stored in a schedule, ReportCaster	adds a -SET for the parameter to the schedule procedure sent to the Reporting Server to be run. A -SET command overrides a value specified in a -DEFAULT command. The following image shows the Task Parameters dialog box displaying the STATE parameter. In the Use Default column, the State parameter shows a value of Yes. In the Parameter Properties section, NY is shown in the Value and Default Value fields. This is the default parameter value. To use a value other than the default value at schedule execution time, so that it will be used even if the procedure is changed, click the parameter and change the parameter value within the Parameter Properties section. Values for simple parameters are specified by entering a value for the parameter in the Value field. There are also static and dynamic parameter types that allow selection of a single or multiple values, which are explained in the following examples. When parameters are stored in a schedule, ReportCaster	adds a -SET for the parameter to the schedule procedure sent to the Reporting Server to be run. A -SET command overrides a default value specified in a -DEFAULT command. The following procedure provides a list of static values that are valid for the CATEGORY (Category) parameter. The following image shows the Task Parameters dialog box displaying the CATEGORY parameter. In the Value column, the CATEGORY parameter has a value of Coffee. Since this CATEGORY parameter has a list of possible parameter values, there is no default value specified. Therefore, the Use Default column is blank. To supply a value for a single select parameter, select the parameter in the Task Parameters table and enter a value in the Value field for the Parameter Properties section. From the list of the values, select a value to assign to the parameter. You can select only one value for a static single-select parameter. The following procedure provides a single select list of values that are valid for the PRODUCT (Product Name) field. This list is dynamically populated with values from the GGSALES data source. 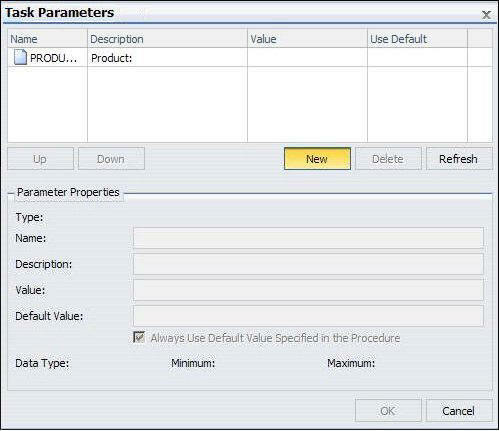 The following image shows the Task Parameters dialog box displaying the PRODUCT parameter. In the value column, the PRODUCT parameter has a value of Espresso. Since the PRODUCT parameter has a list of possible parameter values, there is no default value specified. Therefore, the Use Default column is blank. To supply a value, click the PRODUCT parameter in the table and change the parameter value within the Parameter Properties section. You can select only one value from the dynamic single-select list. The following procedure provides a static multiselect list of values that are valid for the CATEGORY (Category) field. The following image shows the CATEGORY parameter selected in the Task Parameters table. The CATEGORY parameter has been encoded to only use the values Coffee, Food, or Gifts. The selected values will show in the value column. Since the CATEGORY parameter has a list of possible values, there is no default value specified. Therefore, the Use Default column is blank. When the Value button is selected in the Parameter Properties section, a list of available values displays, as shown in the following image. Using the Crtl key, you can select more than one value from the static multiselect list. The following procedure provides a dynamic multiselect list of values that are valid for the PRODUCT (Product Name) field. This list is dynamically populated with values from the GGSALES data source. The following image shows the Task Parameters dialog box displaying the CATEGORY parameter. The CATEGORY parameter has been encoded to use any value found in the GGSALES data source. The selected values will show in the Value column. Since the CATEGORY parameter has a list of possible parameter values, there is no default value specified. Therefore, the Use Default column is blank. When the Value button is selected in the Parameter Properties section, a list of available values displays, as shown in the following image. Using the Crtl key, you can select more than one value from the dynamic multiselect list. A default value is specified in the report procedure (FEX) being scheduled. A value will be dynamically assigned to the parameter by the report procedure (FEX) processing when the scheduled job runs on the Reporting Server. The parameter will not be referenced when the report procedure (FEX) is processed by the Reporting Server. To delete a parameter so that it is not stored with the schedule information, highlight the parameter in the parameter table you want to delete, and click the Delete button. If you need to have the schedule job send a parameter and value that is not defined in the report procedure being scheduled, you can create a new parameter in the Task Parameters dialog box. Parameters referenced during processing by the Reporting Server must be assigned a value for the scheduled job to run successfully. The schedule job log report will contain information when required parameter values were not provided. Click Parameters on the ribbon to display the Task Parameters dialog box, as shown in the following image. Click the New button located above the Parameter Properties section. The Task Parameter dialog box displays, as shown in the following image. Enter a value in the Name and Value boxes. The Name and Value boxes are populated in the Task Parameters dialog box Parameters table. If you would like to specify a description or change the parameter value, select the parameter in the Parameters table and specify the values in the Description and Value fields located in the Parameter Properties section. Click OK when you have completed entering parameter settings for the task. The formats that support bursting are AHTML (except for FML reports), ALPHA, COM, COMMA, COMT, DHTML (except for FML reports), DFIX, DOC, EXL07, EXL2K, EXL2K FORMULA, EXL2K TEMPLATE, EXL97, Flash/Flex, GIF,HTML and HTML ODP (except for FML reports), JPEG, PDF, PNG, PPT, PS, SVG, TAB, TABT, and WP. Coordinated compound reports can only be burst with DHTML, PDF, and PPT formats. When a format is selected, ReportCaster automatically adds an appropriate file extension to the output file name in the Save As field. In certain cases, you must manually change the extension added by ReportCaster. For example, if you select format DHTML in the schedule and the report output is not a web archive file, you must change the extension to .htm. If you select format HTML in the schedule and the report output is a web archive file, you must change the extension to .mht. If you select format EXL07 TEMPLATE in the schedule and the specified template is a macro-enabled template, you must change the extension to .xlsm. For more information about DHTML and EXL07 TEMPLATE formats, see ReportCaster Formats for Scheduled Output. The WP, DOC, and PS formats support printing. The PDF format supports printing when ReportCaster	is configured to enable PDF to print and the printer is configured with the appropriate driver. For more information, see ReportCaster Configuration. 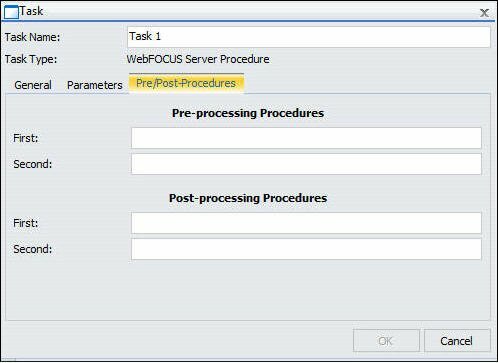 If you are scheduling a Server Procedure or report procedure (FEX), you can schedule a maximum of two pre-processing and post-processing procedures. The pre-processing and post-processing procedures that you schedule must reside on the Reporting Server. Note: All ReportCaster internal variables, which start with &DST, are passed to pre-processing and post-processing procedures so that they are available for application specific logic. For more information, see ReportCaster Variables. The procedure (FEX) name can be entered with or without the application path. When an application path is not specified, the Reporting Server default search path is used to locate the specified procedure. You do not have to enter the pairs in the order in which they are encountered in the procedure. 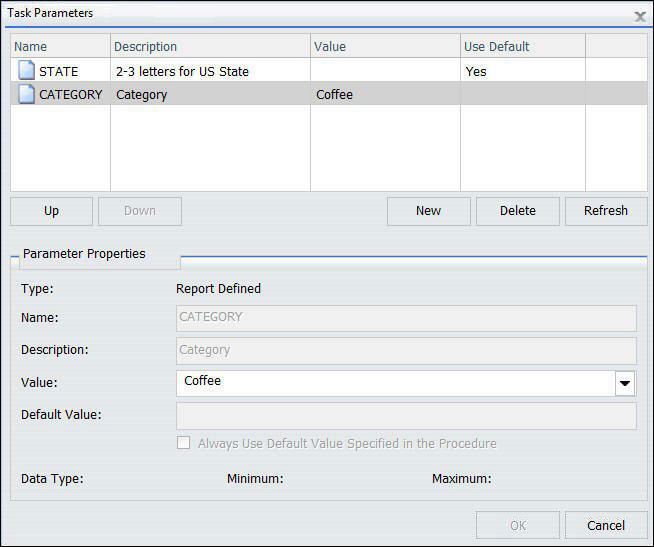 For additional information on supplying parameter values for a procedure, see the Supplying Variable Values From Another Procedure topic in the Developing Reporting Applications manual.